A basic need for all humans is food. It gives us the calories to expend the energy required to move the muscles we have to do the activities that get us through our daily lives. And it doesn’t matter what it is; be it a platter of chicken tenders or a cold bowl of ice cream, it’s food that helps us to live. My own parents’ specialty is a pork-infused hamburger cooked to perfection. Eating it not only tastes amazing but also reminds me of something important: that sharing a meal with the people we care about adds its own kind of flavor. This is the very message that Koufuku Graffiti provides – with some good looking but rather bland eats along the way. Graffiti stars middle school girl Ryou, who currently lives by her lonesome after her grandmother recently passed away. One day, her second-cousin Kirin arrives to go to the same prep school as Ryou, leading to many wonderful moments. What’s interesting about Graffiti’s premise is that it is all about the food. And initially, this seems to only be in relation to its looks and the way in which it is eaten. While this is certainly part of the appeal — and aides in making one hungry while watching — the food serves a greater purpose. And that is in both providing the various slice-of-life antics and in generating the themes that the show hones in on. Starting with the former, it practically comes naturally given the format. Eating meals or having stuff to eat is often done during special occasions and with people close to you. As such, the various happenings in the show follow this concept. From a tiny pizza party to a sandwich picnic, Ryou and Kirin find themselves not only enjoying nice little meals but also enjoying each other’s company while partaking in these delights. 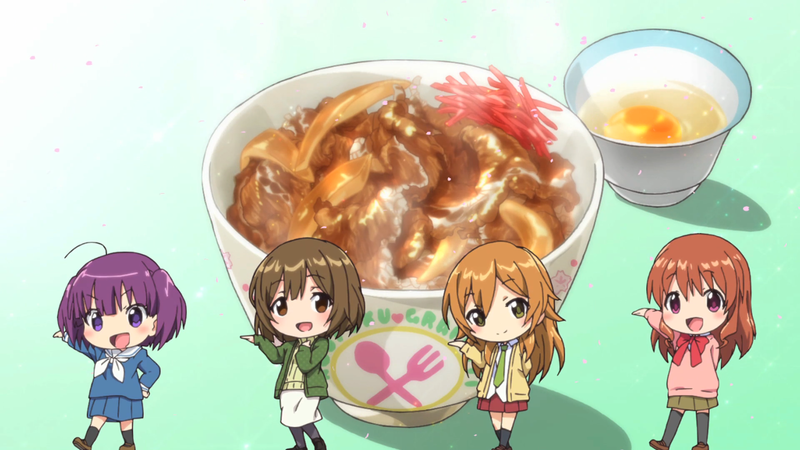 The anime can dip dangerously into repetition, but in an attempt to break up the monotony, the show aims at introducing both comedy and different foods whenever it can. It’s never dramatic, instead relying on the show’s overall cuteness and light-hearted (and heavy stomached) approach to make the separate scenarios gain an aroma of pleasantness that is as nice as the food in which it showcases. And by focusing on different meals, it allows for Graffiti to tackle its themes in slightly separate ways each time. This is an important note; the point of the show isn’t to see the girls’ love the food so much that they enter a euphoric state. Instead, Graffiti’s purpose is in demonstrating the value of relationships, especially so with family. From the very beginning, Ryou feels lonely, finding her time nowadays is filled with sadness rather than the happiness she had whilst her grandmother took care of her. Therefore, over the course of the season, Ryou essentially rediscovers how the connections that are made with the people around her are what make food taste so good. For it isn’t necessarily the taste that counts but more so the love attached to the meal that matters. Ryou learns this when eating a poorly made lunch box by Kirin or when eating a bunch of junk food from the local convenience store; the memories that are made in the “creation” of the food are what taste the sweetest. And at the same time, it’s this same food that brings everyone together. As the ending depicts, Ryou began the year by herself and concluded it with many more people than she initially knew. Kirin, Shiina, Shiina’s mother and maid, Ryou’s next door neighbor, Kirin’s parents; without foods “magical” powers, she wouldn’t be able to enjoy her timenow with others. Food smells good, it looks good, it tastes great, but its food’s ability to seemingly take all these people from different backgrounds and locations, and have them converge for a single moment filled with laughs, stories, and fun, that make it all worthwhile. The art that Graffiti employs is doused in SHAFT’s signature style. That is, many of the shots incorporated are single framed, up close, in slow-motion, and quick to cut from one segment to the next. It actually aids in making the anime feel more “alive” in its presentation. For at the end of the day, it is just food and talking, so seeing the jumpy camera work and swift shots gave a bit of life to this wholly slice-of-life show. 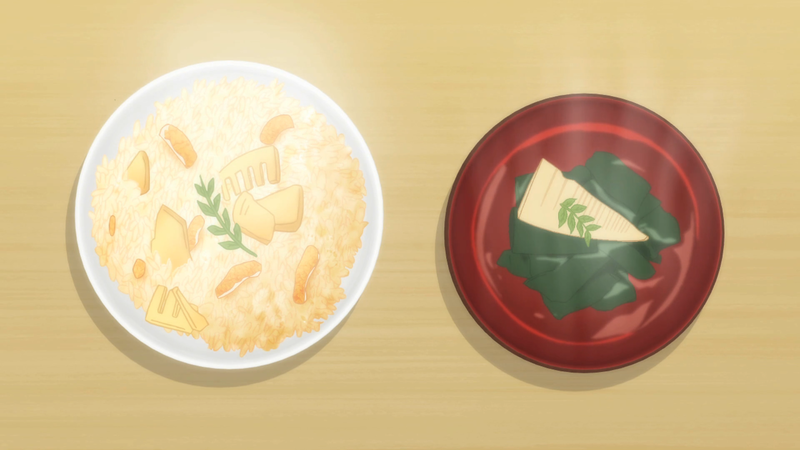 Speaking of the food, the anime does a wonderful job of making everything look quite appetizing. Grilled fish, steamed rice, fried noodles; the show never skimps out at giving the food a large portion in terms of detail. As far as character designs are concerned, they’re rather lacking in appeal, especially in comparison to the art and style that compose them. Ryou is supposed to be in middle school, yet her proportions make her out to be a young woman entering college. At the same time, her plain clothes, plain face, and plain hair make her as common as any other plain Jane. Kirin steps it up a bit more, with her funny meat-looking travel bag, purple hair, and varied outfits to match her fun personality. But Shiina brings it back down, following the same trend as Ryou: uninspired and seemingly devoid of attention. Surprisingly, despite SHAFT’s direction, the show actually makes a lot of its pomp and flair move. The characters see a lot of bodily use outside of their mouths and hands for eating, with fluid actions taking place in most situations. Ryou can usually be found cooking, Kirin is always bouncing around, with Shiina and the others either silently watching or participating in the festivities. There are really only three prominent characters throughout Graffiti: Ryou, Kirin, and Shiina. 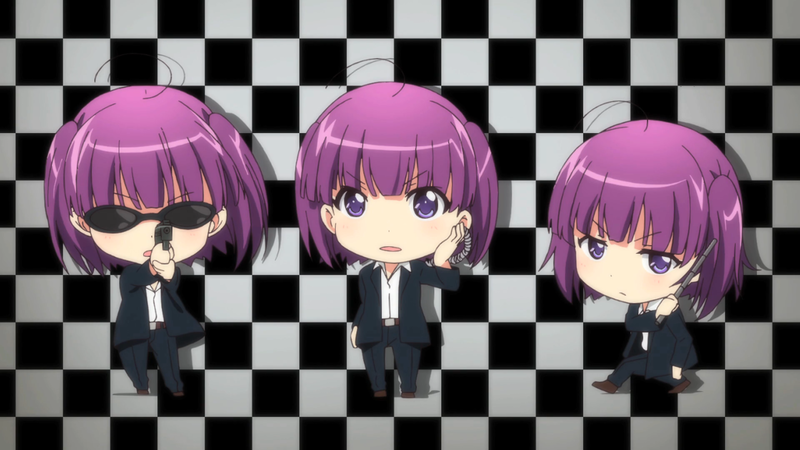 While Ryou is the star, she isn’t the “best” character that the anime has to offer. As has already been discussed at great length, Ryou is someone who values others, more so than she values herself. 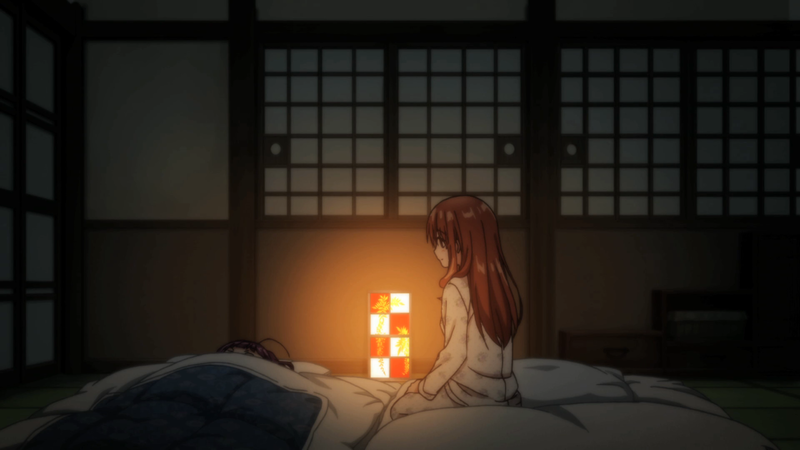 And to that end, when she isn’t surrounded by people, she isn’t only physically lonely but spiritually lonely, too. One of the constant themes in regards to her person is the grandmother that both taught her how to cook and taught her how to treat those with her cooking. Following Kirin’s inclusion, what we see is her grandmother’s tactics shining through; she cares for her cousin, feeds her, protects her, essentially raises her, allowing Ryou to see that her own person is worth a lot more than she gives herself credit for. Her development seems rather small over the course of the show due to the episodic nature of it all, but similar to the meals she serves, what she learns through helping Kirin is that it isn’t the quantity of experiences that matters but the quality of them that does. Kirin is arguably the strongest character within Graffiti, if only because she provides nearly all of the comedy that the show has to offer. She acts as a kind of foil to Ryou; where Ryou is very calm, motherly, and quiet, Kirin is somewhat hyper, childish, and loud in whatever she takes part in. Such a dichotomy allows the audience to see how sensible Ryou is while showcasing how ridiculous Kirin tends to be. But her rather immature antics suffocate something she actually does better than Ryou, and that’s understanding someone else’s feelings. Or at least, understanding Ryou’sfeelings. She complements Ryou quite well; Ryou takes care of Kirin physically because she can’t do it herself, whereas Kirin takes care of Ryou emotionally because Ryou can’t do it herself. They’re family, they’re friends, but more than that, they’re compatible due to their inability to live life without the other. 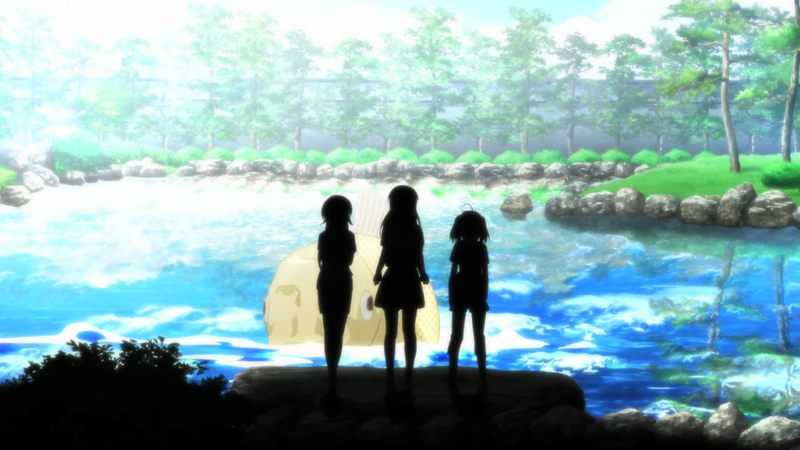 As more or less the “third wheel” for the group, Shiina sits in the middle of the rather strange duo. This is purposeful, because she represents the balance between the two. She understands who she is and is able to take care of herself. So, what can she possibly offer? While she only receives minimal focus throughout the anime, due to her plateaued characterization, she represents a simple theme: everyone gets help. Whether you’re someone who is struggling with the work you are doing or you happen to have everything perfectly organized, nobody goes through life or any event without some outside support. So while Shiina may seem like she doesn’t require people looking after her, the reality is that the position she holds is precisely because there have been those around her guiding her down the correct path. As you move down the list, their overall importance dwindles rapidly yet each brings about their own strengths even if they all don’t see as much focus as needed. Their one commonality, though, is the manner in which they eat their food; more specifically, each does it in a rather avant-garde manner. Ryou eats beautifully, Kirin tends to scarf everything down, and Shiina consumes in a refined way. In other words, the way they eat actually symbolizes their respective personalities. Ryou is “beautiful” in the kindness she holds, Kirin is pretty rambunctious, and Shiina doesn’t stray from her emotionless behavior. The group, in a sense, shows their true selves through the food they enjoy, demonstrating once again food’s ability to be more than simple sustenance. The opening theme for the anime maintains the same, consistent beat throughout its run. Unfortunately, despite the track sounding so inviting, it isn’t very compelling. It’s rather generic, with the singer not showing much range due to having to almost “speak” the lyrics to the audience that hears it. The ending theme is a small step up from its counterpart. Instead of being bland, it takes on a bit of spice, and that’s not just in the visuals it presents. The characters take turns singing different bits, with various inflections and musical tones used throughout to make the piece more lively and satiating. The soundtrack, “Edible Melodies,” isn’t particularly impressive, but it does contain some pretty appropriate pieces. “Tama go no Samba” is perhaps one of the more memorable ones, being played during the cooking and more fun moments. “Russian Ruretto Sand” highlights the OST’s cultural influence that some of the tracks employ. And “Skinship Sakuramochi” has that homely, slice-of-life feel that only this genre of anime could generate. However, nearly every track incorporates not so much a background singer but a background “noise maker;” the woman or women use a lot of onomatopoeia (lots of “ooh,” “la,” and “ah” being said) to make each individual song take on a more unique feel. As a side note, there are two notable sound clips. The first is Kirin’s walk cycle; each step she takes is followed by an audible “bubble” noise, which further signifies her as the “bubbly” girl of the show. The second, and for some Graffiti’s only defining feature, is the post-ending sing-a-long. It’s cute, fun, and catchy; unsurprisingly, it’s very memorable. Finally, in terms of voice-acting, everyone involved performed rather well for their respective parts. Rina Satou as Ryou for her incredibly soft way of speaking and Asuka Oogame as Kirin for her always peppy personality deserve special shout-outs. The majority of the entertainment that the anime provides comes from Kirin. Her silly jokes, overreactions, and unending happiness are usually enough to make anyone gain a huge smile on his or her face. Ryou and Shiina help with the comedy from time to time as well, but it’s usually them jumping off of Kirin’s unintentional setup or at the expense of her character. Regardless, it’s usually funny and always adorable. Unfortunately, the rest of the show is bogged down by monotony. While the themes are warm due to endearment, the anime tends to be rather dry when it isn’t succeeding at the hilarity. And it isn’t necessarily the show’s fault; it really is just food and talking, so nothing too exciting is occurring. Watching Ryou or Kirin eat food the exact same way each episode doesn’t do much for me, and when Kirin isn’t around, everything becomes quite slow. Her inclusion breathes life into the anime, so when she is excluded, the show begins to die until it takes that much needed next breath. 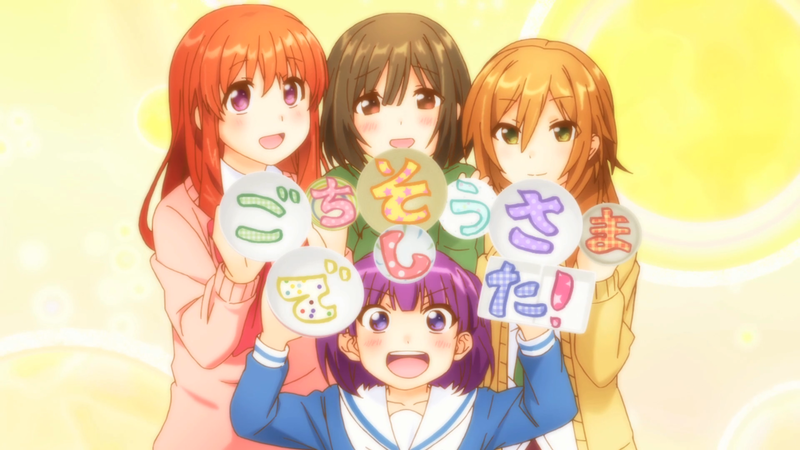 Koufuku Graffiti is definitely an anime about food, but that’s not its primary focus. The food is a vehicle for the themes presented. Sadly, due to unfortunate repetition, a lackluster sound department, and long stretches of boredom, the show tastes slightly tolerable instead of fresh off the farm. Well it is to be expected that the younger one, who is a bit childish, will heave the humour of the show while the older and mature are more doown to earth. > …will heave the humour of the show while the older and mature are more doown to earth.